Writing in the 1950s, the travel writer H.V. 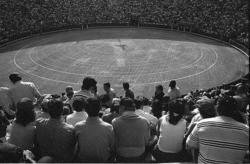 Morton gave this account of a bullfight he saw in Seville. “The clock strikes. There is a roar of applause as the president enters his box, the only proof that Spaniards can keep an appointment to the second. He gives a signal, and as the gates swing wide there enters a bizarre procession which has reminded many observers of ancient Rome. The matadores in their gold-embroidered jackets, knee breeches, jam-puff hats, magenta cloaks folded over their left arms, walk across the sand with a swinging stride, indifferent to the applause. There are three of them walking abreast; behind, in file, walk their cuadrillas, or assistants, dressed, but not so grandly, in the same style. 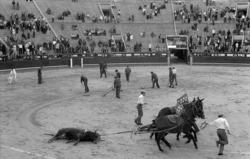 There are banderillos, who stick darts into the bulls, and picadores, who lance the bull in the neck and wheel their horses so that the animal may have something to attack and gore. It seems hardly possible that such miserable horses can walk upright. They are poor, terrified old crocks, black with sweaty fear. They know what is coming to them. Their mouths are drawn back over teeth the colour of tobacco juice. Their right eyes are bandaged so that they cannot see the bull when he comes to tear out their guts. Not everyone knows that their vocal cords are cut, because the scream of a horse is a sound that even a bull-fight crowd would not enjoy. On one side of their aged and bony flanks hangs a quilted mat which, in theory, prevents them from being gored. This is the end and reward of a lifetime of service to Man. 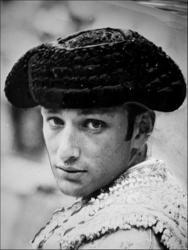 As the matadores and their troupes walk forward to make their bow, I notice that every man is out of step. Englishmen or Germans could not do this, or only with difficulty; it would not be natural for them to be out of step as it is for Spaniards. Yet there is something individualistic and impressive about this lack of step; each man puts on his own particular swagger. They bow. They do not lift their hats, but press them more firmly to their heads. They do not look around at the people or curry favour in any way with the noisy fans. Custom demands that they shall look casual and unconcerned, solemn and grave as priests of Mithra about to perform a sacrifice. The ring is now empty. The president gives a sign. The door of the bull-pen is opened and one would like to be able to say that several tons of black fury hurl themselves into the ring. Instead, a rather small black bull ambles out with the idea that he is free and in a moment he will catch up with the herd. Then he knows that something is wrong. The noise. The strange smells. As he emerged, from the pen, someone, to smarten him up, had stuck a dart in his left shoulder from which flutter the colours of his breeder. The wound begins to bleed and sting slightly as the air gets to it. He is more puzzled than angry. As he is wondering what this can mean, he sees two men running with little tripping steps, their feet in black dancing pumps, as they trail capes. The bull has never seen a cape before. All bulls are fought on this understanding. He looks at them in bewilderment, then, deciding that they are, if not dangerous, at least provocative, charges and misses. 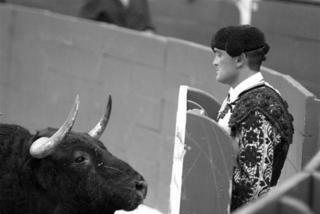 Behind the barrier the matador is watching to see which horn he uses. 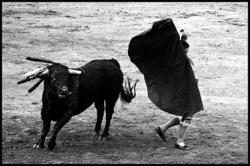 Having sized up his bull, the matador appears, the others retire, and he attracts the bull’s attention, holding a coloured cape in both hands. He stands still, hardly moving his feet, and waving the animal past him with the cape. Every time he performs one of these beautiful movements, in which grace and courage are equally present, a deep shout, which sounds like ‘Allah!’, comes from the crowd, and each pass is succeeded by this cry, and ‘Allah! Allah! Allah!’ comes from every part of the arena. It is spelt Olé. Surely it is the voice of Moorish Spain? Where have I heard it before just like this? I remember. It was in the streets of Bagdad one night when, concealed behind a curtain, I saw the half naked shia penitents whipping themselves through the streets during a Moharram procession and crying, every time the whips came down on their bleeding backs, ‘Ah-Al-lah! … Ul-lah! Al-lah! … Ul-lah!’ As I hear this great roar of Olé it sounds to me just the same. 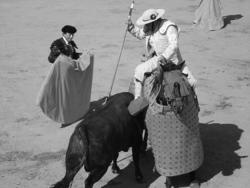 The matador retires and a picador rides in astride his voiceless victim. The bull must now be bled. It is said that no man could kill a bull on foot with a sword unless its neck muscles had been so much weakened that it lowers its head for the sacrifice. Therefore the first blood is drawn by the picador. Seeing this grotesque intruder, the bull charges. The picador, grasping a six-foot lance, drives the point into the bull’s neck, and so they stand a moment, the man thrusting, the bull pushing. Suddenly, the animal breaks away from the spear and rushes at the horse. There is a leathery bang as the horns hit the peto, or protective mat, but the horse is so feeble that he cannot remain on his feet. 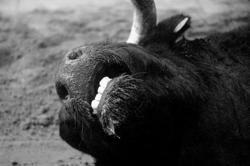 He falls not because the bull is powerful and fierce, but because he is old and weak. He falls with all four legs in the air, his belly exposed. There is a confusing scramble as the picador rises to his feet, and other members of the troupe come out to help him; but the bull, having at last found something tangible, slashes the horse’s belly right and left. The terrified creature lifts a long, stringy neck; its unbandaged eye is bursting with fear; its mouth is wide open, exposing those poor old brown teeth. But no sound comes from it; and the bull goes on lifting and slashing. Red capes are waved. The bull leaves the horse. A big rosette of blood is bubbling on his shoulder where the lance went in. The horse lies, its mouth open, giving gasping breaths. A man runs up and pulls at the bridle. He aims a kick at the bony ribs, and, with ghastly effort, the poor framework rises, but it is more a caricature of a horse than ever. Its hind legs are out of action. It squats in agony, turning its head to left and right. I hope it’s dying; but no, suddenly it manages to stagger to its feet. Entrails hang from its stomach in different shades of red. A man takes a handful of tan from the ring and tries to push them back, but they fall out again like red eels. They drag the horse out of sight. He will die behind the scenes or perhaps, if he can stand, straw will be packed into the wound and he may be forced into the ring again. Now the spectacle moves to act two. The banderillos step forward delicately holding harpoons wreathed in coloured paper. They hold them mincingly by the tips and the ends that go into the bull have fish-hook barbs. As the bull approaches, the banderillos stand on tiptoe and neatly plant a pair of harpoons in the beast’s shoulder as he gallops past. The bull is hurt and surprised. He stops and stands miserably in the centre of the ring, shaking his head and trying to lick the blood from his back. Every time he moves, the fish hook barbs tear his flesh and the wounds begin to froth in pink bubbles. He cannot shake out the darts. He is entirely occupied with his own pain and misery. Then he slowly shakes his head and moos like a cow, a deep, plaintive hurt sound that says, ‘Why are you doing this? Let me out. I don’t understand.’ Immediately in front of him stands another bandillero, waiting with two more darts. But the bull won’t charge. 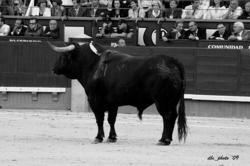 The man and the bull face each other and nothing happens. The man jumps up and down like a jack-in-the-box to provoke the bull. The crowd begins to laugh. They shout advice. But they soon get angry because the bull won’t play. They hiss. 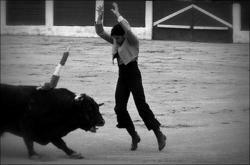 The banderillo, alarmed by the cries of disapproval, runs lightly to the bull and plants two more darts in his shoulder. The animal bellows in pain and twists round, mouthing at the wounds and trying to get rid of the things that are tearing him. Blood is now plastered on his flanks in dark streaks. He smells it and it frightens him. He runs to the side of the ring with the banderillas shaking and knocking together. He is a piteous object. But the crowd jeer at him because he is not a toro bravo. His death is evidently not going to be very exciting. This is the moment when someone ought to have the decency to come in with a humane killer. But the ceremony has to be played out to the end. A handkerchief waves from the presidential box, the trumpets sound as if something tremendous is going to happen, and out steps the matador with his sword. 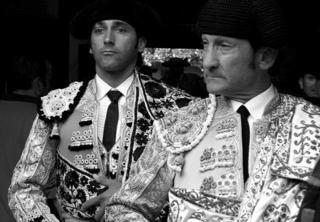 The time for sacrifice has arrived.The matador stands with the sword in the curve of his arm and in a loud voice dedicates the bull to someone in the crowd. The trumpets sound again as he advances to the sacrifice. But the sacrifice is thinking only of its own pain and woe. The blood is now running down into the sand. The bull stands with lowered head, lost in misery. The bull wants water. He scrapes the hot sand with one foot and drops his muzzle, snuffling. 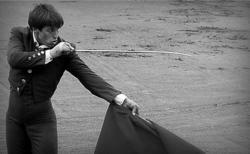 The matador stands a few yards off, holding the sword concealed in the muleta, a strip of red flannel. He taunts the bull. He calls him names and dares him to charge. Quite surprisingly, the bull does charge. The matador is ready for him and slides round as usual as he runs past; but the animal, tired of being deceived, instead of returning to the unequal battle trots over to the same old place in the ring which he has made his own. Three or four times the matador provokes the bull to charge; but he just stands there with lowered head exposing that place which is said to be the size of half-a-crown that leads neatly down to the region of the heart. Now the moment has come, the ‘moment of truth’. Here it comes! 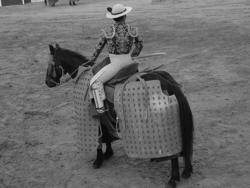 And the bull walks off in a quiet, dignified way, with the idea of getting back to his querencia, the same spot in the corner, but he never gets there. Half-way he stops. His head goes down. His body sags. He looks as if he’s going to be sick. He is. Thick blood pours from his mouth. Slowly, very quietly, he sinks to his knees and stays like that as if in prayer. Suddenly he falls over dead. Olé. 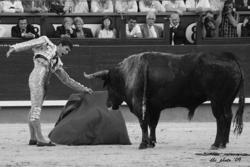 The matador bows like an actor. The painted girls shrug their shoulders and fumble for their lip-sticks. Three mules harnessed abreast gallop in to a sound of bells, a rope is flung round the bull’s horns and the last we see of him is an undignified shape, legs in air, cleaving a red path in the sand. The gates open and shut. The butchers pick up their knives. 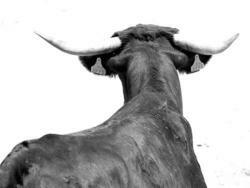 The door of the toril opens again and a second bull runs out. In twenty minutes he also is dead. When the sixth bull has coughed up his heart’s blood the day’s sacrifices are over. The crowd departs, exhausted with emotion, to sit in the cafés and bars and discuss every moment in the greatest detail, recounting beauties which no one but a Spaniard can ever hope to see. You can buy H.V. 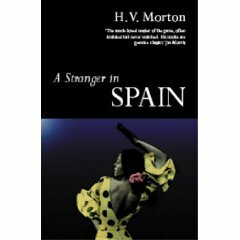 Morton’s book, A Stranger in Spain, on Amazon.